Even though the Los Angeles heat is strong, I’m not letting that hinder my gym routine! I’m trying to get into the habit of going at least three times a week, and I really have no excuse considering we have a gym in the apartment complex. It’s not only easier for me to commit to going, but also easier for me to freshen up afterwords being only a few steps from my front door. So when I’m on a time crunch and need to go from working out to meeting a friend for lunch, I’ve got my whole beauty arsenal at my disposal. But, I remember what it’s like to actually have to go to a gym and get ready in the locker room for whatever plans you had next. I sort of mastered the locker room beauty routine with a few key products that would keep me looking fresh and have me confident to get on with my day. 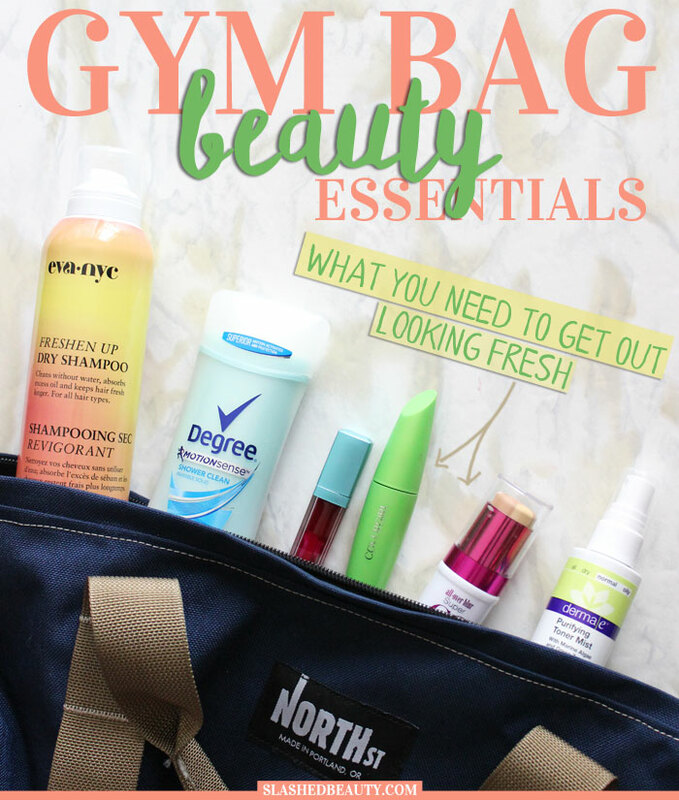 Here are my gym bag beauty essentials that were always in my bag, or kept in my locker. Even in an air conditioned gym, sweat builds up at my scalp, weighing my hair down and making it look oily. Dry shampoo is always a must post-workout if you don’t have time to actually wash your hair, as it will absorb oil and give your hair a boost of volume. But sometimes, dry shampoo can make our hair look a little too dry, so follow up with dry conditioner to add back some shine and softness. These little single-use packets contain powder that activate under water to become a cleanser! They’re a lot more convenient than packing your big bottle of go-to cleanser, and the cleanser formula itself is calming and refreshing while it washes away dirts and oils. This little spray is an easy way to tone and rebalance your skin. Usually after working out, my skin looks kind of splotchy and red (especially from wiping with a towel repeatedly) so this helps calm it even further. For obvious reasons… but seriously, this is my favorite deodorant and releases fragrance with friction, so you’ll stay smelling fresh when you’re moving most. It goes on before and after a workout, but has 48-hour protection just in case you forget it. Although this is marketed as a color correcting primer stick, it really works just like a CC cream stick providing light coverage to even out the skin tone. Since I don’t like putting on a full face of foundation right after a work out, this is just enough to create a fresh faced, healthy skin look. I’m loving this dual-purpose bronzer, which has a matte side and a shimmer side to add both definition and glow to the face. It also comes in a huge compact that comes in handy when you don’t feel like fighting over mirror real-estate with other gym rats. A blush that has a tasteful glowing sheen to it will work as a two-in-one blush and highlighter to add color back into the face and give you a glow that doesn’t read oily. 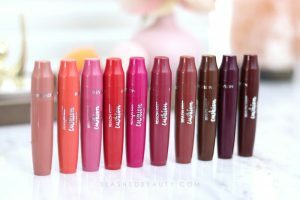 A colorful lip stain will make your lips stand out without going too bold, spicing up a no-makeup makeup look to be a little more colorful. 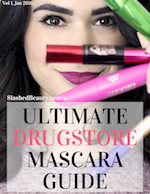 I don’t know about you, but a good coat of mascara on freshly curled lashes can make me look and feel more awake and ready to go. Wiggle the wand right up against your lash line for a short-cut eyeliner look, and pull through the lashes to separate and fan them out. Perfect for applying your blush, bronzer and contour shades, a double ended brush will be your best friend in completing your locker room beauty routine without lugging around multiple brushes. These come in handy both during and after your workout! I love these headbands because they’re fashionable, and can be worn either folded thinly or expanded to pull back the hair or absorb sweat from your forehead. They’re super comfy and don’t give me a headache, and look great if I just want to get my hair out of my face for the rest of the day. 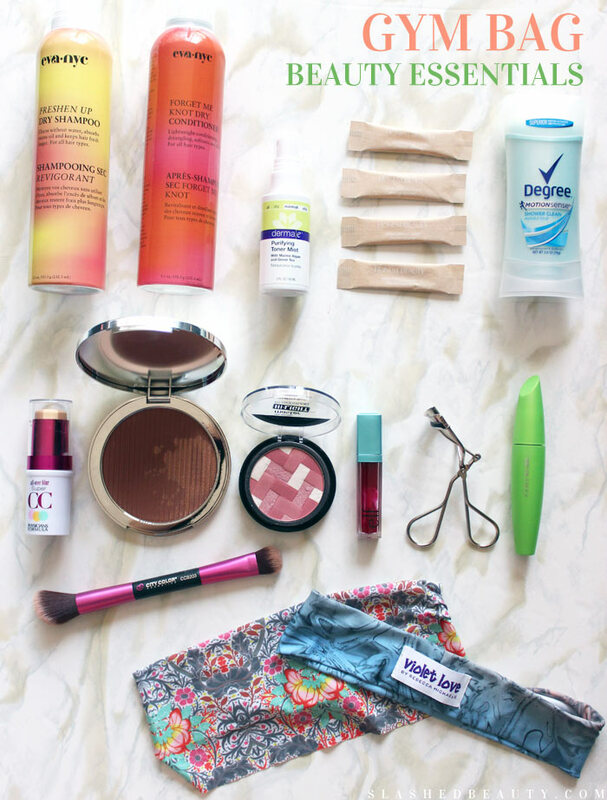 What are your gym bag beauty must haves?